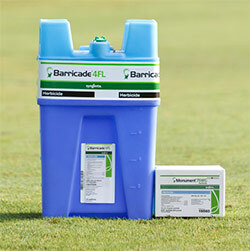 Barricade® herbicide from Syngenta offers you a guaranteed crabgrass control program. A single fall application will control next season’s crabgrass, providing maximum application flexibility. Its low solubility and volatility means it stays in the weed germination zone and won’t break down, even after heavy rain or snow. As a result, you can spread out your workload to make next spring less hectic. Barricade qualifies for the Barricade Brand Bonus and is available as part of the Warm Season Herbicide Solution pallet, which also contains Monument® herbicide when purchased by December 7, 2017. For more information, please visit GreenTrust365.com. ©2017 Syngenta. Important: Always read and follow label instructions. Some products may not be registered for sale or use in all states or counties and/or may have state-specific use requirements. Please check with your local extension service to ensure registration and proper use. Barricade®, GreenTrust®, Monument® and the Syngenta logo are trademarks of a Syngenta Group Company. Syngenta Customer Center: 1-866-SYNGENT(A) (796-4368).